किंगफिशर (एल्सिडो एथिस) की व्युत्पत्ति अस्पष्ट है; या शब्द किंग'ज़ फिशर से आया है, लेकिन इस नाम का प्रयोग क्यों किया जाता है यह ज्ञात नहीं है।. ↑ अ आ Moyle, Robert G (2006). 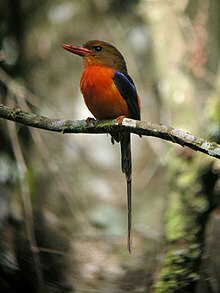 "A Molecular Phylogeny of Kingfishers (Alcedinidae) With Insights into Early Biogeographic History". Auk. 123 (2): 487–499. डीओआइ:10.1642/0004-8038(2006)123[487:AMPOKA]2.0.CO;2. ↑ अ आ इ ई उ ऊ ए ऐ ओ Woodall, Peter (2001). 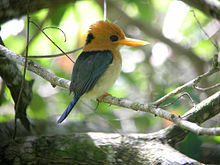 "Family Alcedinidae (Kingfishers)". प्रकाशित del Hoyo, Josep; Elliott, Andrew; Sargatal, Jordi. Handbook of the Birds of the World. Volume 6, Mousebirds to Hornbills. Barcelona: Lynx Edicions. पपृ॰ 103–187. आई॰ऍस॰बी॰ऍन॰ 978-84-87334-30-6. ↑ Bancroft, Wilder; Emile M. Chamot, Ernest Merritt and Clyde W. Mason (1923). "Blue Feathers" (PDF). The Auk. 40 (2): 275–300. ↑ Schulz, M (1998). "Bats and Other Fauna in Disused Fairy Martin Hirundo ariel Nests". Emu. 98 (3): 184–191. डीओआइ:10.1071/MU98026. ↑ Legge, S; A. Cockburn (2000). "Social and mating system of cooperatively breeding laughing kookaburras (Dacelo novaeguineae)". Behavioral Ecology and Sociobiology. 47 (4): 220. डीओआइ:10.1007/s002650050659. ↑ Douglas Harper (2001). "Online Etymology Dictionary". अभिगमन तिथि 2007-07-14. ↑ Birdlife International (2009). "Todiramphus godeffroyi". Red List. IUCN. अभिगमन तिथि 12 दिसम्बर 2009.